Camden Town station is a pretty grotty place. A crime hot spot, it is so overcrowded it has to shut its doors to passengers coming in on Sunday afternoons. But it is a key north London station where both branches of the Northern Line converge and for 10 years London Underground (LU) has struggled to come up with a solution. Over the years it has produced 16 different designs, the latest of which was rejected in December by Camden Council. Now the scheme for a larger station, which bears more than a passing resemblance to Canary Wharf, is the subject of a public inquiry which began this week. None of LU's previous schemes has got this far, but the company's legal team still has a big fight on its hands. People come to Camden because of the individual stallholders. They will start to realise it has been 'gentrified' and won't come. They have to persuade the planning inspector that their client should be granted compulsory purchase powers to buy up 'the Triangle' - land bordered by Kentish Town Road, Buck Street and Chalk Farm Road. It wants to use the land to create a temporary station, which would probably last three or four years, while work is carried out. Once the new station is built LU would sell off the "air rights" above the ticket hall, which will be covered by a modern six-storey glass-fronted building. But those on the site - the 109 stallholders on The Camden Market, the owners of the Electric Ballroom and those at the United Reformed Church, are very unhappy. LU has offered to build a new church and re-house the Electric Ballroom. 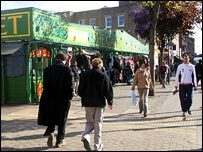 But some stallholders see it as a battle with big business, as the plans include replacing one of Camden's six open air markets with high street chains and offices, as well as flats. Spokesman for the market's freeholders, Camden Lock (London) Ltd, Henry Lennard said there were rules for compensating landowners, but they were determined it would not get to that stage. He said: "They are going to destroy basically 109 businesses and put 340 people out of work - that's without the question of the merits of the case." He and other objectors say Camden Market is crucial to the local economy and, without it, LU's predictions for ever-increasing passengers may fall well short of reality. "We are saying the basis of their case is wrong," said Mr Lennard. "The whole point is, people come to Camden because of the critical mass of individual stallholders. They will start to realise it has been 'gentrified' and won't come." He is not alone. Of the 229 interested parties who wrote to the inquiry - only two voiced support for the scheme. Among objectors was the Keep It Camden campaign, whose spokesman Steve Lucas argued vocally for the whole nine-week inquiry to be webcast and archived, so those who were not able to attend could watch the show. There is the Camden Town Conservation Area Advisory Committee, the Camden Civic Trust, the Camden Town Urban Design Improvement Society, the list goes on. Even Simon Hughes MP, the Liberal Democrat candidate for mayor of London, is due to make an appearance. Objectors will argue that LU's plans are not the only option - they have drawn up their own alternative scheme - and say compulsory purchase should only be used as a last resort. 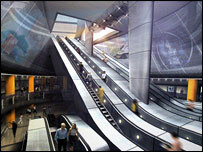 But LU says the station's problems are both "extremely obvious and require an urgent solution". Its barrister Richard Drabble QC told the inquiry the scheme would also bring affordable housing, better transport links to buses, as well as a "high quality, modern" station. He defended the size of the £130m scheme, saying: "The 'design life' of the station is 120 years and it is essential...that the station can cope with future flows throughout its life span." The inquiry, at the Friends' Meeting House on Euston Road, Euston, north London, is scheduled to last nine weeks.